Alain Graillot founded his domaine in Crozes-Hermitage in 1985, and rapidly became one of the most in-demand producers in the Northern Rhone for his exuberant, robust, and complete Syrah-based wines. Alain owns 50 acres of 30-year-old Crozes-Hermitage vines on the flat alluvial plain between the Rhône and Isère rivers, in well-draining soils of sand, gravel, and stones. He also has two tiny parcels in St. Joseph, from which he makes a slightly fresher, more early-drinking wine than the remarkable Crozes-Hermitage that constitutes the majority of his production. Alain harvests by hand and works organically, employing whole-cluster fermentation and aging the wines primarily in 1-to-3 year old barrels purchased from some of the top estates in Burgundy. 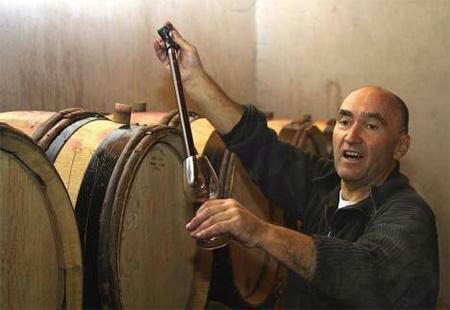 In great years, he makes tiny quantities of a barrel selection knows as "La Guiraude," a rare and spectacular wine. Graillot's wines are structured, but still very appealing and approachable in their youth, and their longevity is truly remarkable... These are must-haves for any serious Northern Rhone fan. Wine Advocate 91-93 "Tasted from tank, the 2016 Crozes Hermitage delivers scents of road tar, black olives and blackberries. The tannins are silky, the acids fresh, the overall impact delicious. This medium to full-bodied wine should be ready to drink on release and drink well for 6-7 years."